It was well over five years ago that I read the first volume in Gaiman’s classic graphic series, so I actually went back and reread Volume 1: Preludes and Nocturnes before reading this. I was glad I did. I would have missed a lot of the nuances had the beginning of the saga not been fresh in my mind. In his introduction to this volume, Clive Barker describes what he calls “fantastic fiction” and explains why the graphic novel/comic genre is ideal for exploring this type of narrative. The second kind of fantastique is far more delirious. In these narratives, the whole world is haunted and mysterious. There is no solid status quo, only a series or relative realities, personal to each of the characters, any or all of which are frail, and subject to eruptions from other states and conditions. One of the finest writers in this second mode is Edgar Allan Poe, in whose fevered stories landscape, character – even architecture – become a function of the tormented, sexual anxious psyche of the author; in which anything is possible because the tales occur within the teller’s skull. Is it perhaps freedom from critical and academic scrutiny that has made the medium of the comic book so rich an earth in which to nurture this second kind of fiction? Essentially, this volume is a dark exploration of the possibilities of what might happen if the boundaries of dreams were somehow dissolved, where the collective subconscious minds accessed by all dreamers were connected, and the effect that this might have on our notion of reality. She can feel them: across the city, a paradise of sleeping minds. Each mind creates and inhabits it own world, and each world is but a tiny part of the totality that is the dreaming… and she can touch them. Touch all of them. She begins to free them, loosening them into the flux. Across the city dreams begin to join and integrate and, in so doing, they change the dreamers forever. What we deem as reality is actually a shared perception, and the key word here is perception. How real is reality? We spend a third of our lives in a dream state, and how do we know that what we perceive while in this state is not as real or more real than what we accept as reality in the world around us? This is what one of the main characters, Rose, contemplates toward the end of the book. If my dream was true, then everything we know, everything we think we know is a lie. It means the world’s about as solid and as reliable as a layer of scum on the top of a well of black water which goes down forever, and there are things in the depths that I don’t even want to think about. It means more than that. It means that we’re just dolls. We don’t have a clue what’s really going down, we just kid ourselves that we’re in control of our lives while a paper’s thickness away things that would drive us mad if we thought about them for too long play with us, and move us from room to room, and put us away at night when they’re tired, or bored. This is an idea that I have always found unsettling. I have known people who for various reasons suffered a break with reality and ended up institutionalized. I could not help but wonder: Was it mental illness, schizophrenia, or a glimpse of something that mortals were not meant to know? When Dante is about to cross the threshold in the Inferno, he is warned: “Abandon all hope, ye who enter here.” Some things are too intense for the fragile human psyche. I plan on continuing with this series (I already have the next volume ready to read). Expect to hear my thoughts on Volume 3: Dream Country in the near future. The play begins with a soliloquy in which Prometheus, bound to the rock, speaks out against God as the oppressor of humanity. With fear and self-contempt and barren hope. O’er mine own misery and thy vain revenge. From thine unenvied throne, O Mighty God! Insect, or beast, or shape or sound of life. Ah me! alas, pain, pain ever, for ever! Prometheus is immediately established as the archetype of rebellion, defiant and opposing the force of tyranny which is represented by God. What I find most interesting about this passage is how Prometheus compares and contrasts with Christ. Both figures are bound: Christ to the cross and Prometheus to the rock. The difference is in how each figure reacts. Christ, while questioning God’s motivation, is accepting of his fate. This is not the case with Prometheus. 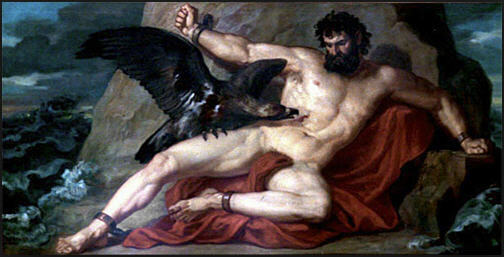 Prometheus, like Satan, refuses to accept God’s will. He is filled with self-righteous indignation and believes that he is justified in his actions. The next part of this soliloquy which is worth pointing out is Prometheus’ description of his imprisonment and torture. Eat with their burning cold into my bones. Of whirlwind, and afflict me with keen hail. Here we have images of captivity connected with ice. I see the ice as representing a several things. First, it symbolizes the cold, harsh judgment of God. Secondly, it symbolizes memory, clear, yet hard and painful. The coldness of the ice burns, implying that memory as well as God’s judgment both cause internal pain and turmoil. Finally, the imagery connects the text to Dante. In The Inferno, the 9th circle of Hell is the area in which sinners are imprisoned within an icy lake. It is worth noting that Judas is trapped in the 9th ring. Toward the end of his soliloquy, Prometheus, ever defiant, emphasizes that his wisdom stems from his rejection of God and the suffering which he endured as a result. As then ere misery made me wise. This for me embodies the romantic ideal. Emotion is what makes us human and divine. And pain and suffering are powerful emotions which are often fuel for creative and artistic expression. Hence, Prometheus serves as a symbol for humanity’s creative and artistic spirit, which is often contradictory to the tyrannical forces of social mores which seek to instill conformity and compliance. Thanks for stopping by, and I will post more on this great dramatic work soon. I’m still on the fence about this comic. 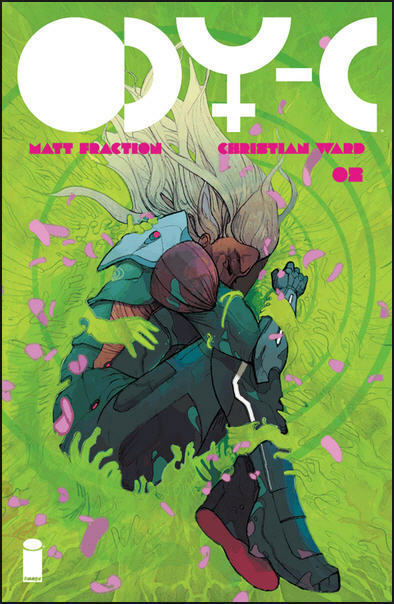 I love the artwork, which is nothing short of stunning; but while the story has gotten a little more cohesive, the writing still feels somewhat choppy. I’m giving it one more issue to decide. In this installment, Odyssia and her crew encounter the lotus-eaters. As I said, the artwork is stunning. The vivid colors and surreal images really capture the descent into a drug-induced state. I also found it interesting that the story incorporated different levels of intoxication and addiction, reminiscent of the levels in Dante’s Inferno. Each level is also connected to one of the deadly sins and serves as another trap to ensnare a person’s consciousness and destroy the desire to return to reality. This comic really has a lot of potential. The ideas are fresh and the artwork is excellent. I really hope the writing catches up. I was flipping through my copy of English Romantic Writers when I came upon this sonnet. I had underlined parts, so I assume I read it in college, but honestly, I don’t remember. Anyway, I read through it a couple of times so that I could get a deep sense of the poem. O golden-tongued Romance with serene lute! Fair plumed Syren! Queen of far away! I must confess that I really wanted to like this poem more than I actually did. I mean, it’s John Keats writing about King Lear—it has to be good, right? This was one of the reasons I read it twice in the sitting; I couldn’t help thinking that it was better than I thought and I therefore must be missing something. As I think about it now, it was all the exclamations that turned me off. It just felt like forced ostentation, like he was intentionally trying to be showy. One, maybe two exclamations would have been OK, but five is just overkill. While I didn’t care for the poem’s style, the emotion and ideas contained in the poem were interesting for me. Keats is setting aside his urge to create poetry to indulge himself in one of Shakespeare’s greatest works. But more importantly, he seems to be replacing his muse with Shakespeare. Instead of supplicating to some divine entity for inspiration, he turns to the works of another human. I think this is pretty major, especially since Keats seemed to be obsessed with ideals: Truth, Beauty, etc. To seek these in the works of man as opposed to the divine was quite a change. I found the ending of the poem to be the most thought-provoking part. Not only did I picture Lear wandering, lost, suffering the repercussions of his choices, but I also pictured Dante in the woods, abandoning all hope as he enters into the Inferno. 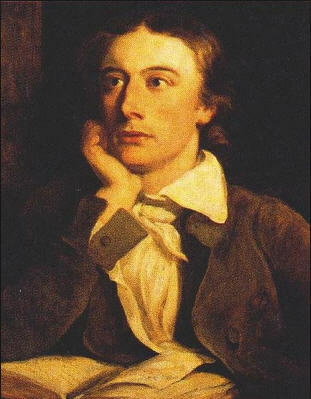 Then, after the flames burn away the sins and regrets of mortal life, Keats longs to rise from the ashes and have his soul become one with his desire, which is the divine source of Truth and Beauty. Overall, it is not a bad poem, just not as good as it could have been. And again, what I didn’t like about it was very subjective. Others may like it. Feel free to share your thoughts. Cheers! !